Deccan Chargers 177-4 (Cameron White 78, Jean-Paul-Duminy 26*, Bhuvneshwar Kumar 1-34) beat Pune Warriors 159-7 (Robin Uthappa 29, Steven Smith 26, Ashish Reddy 2-32) by 18 runs. 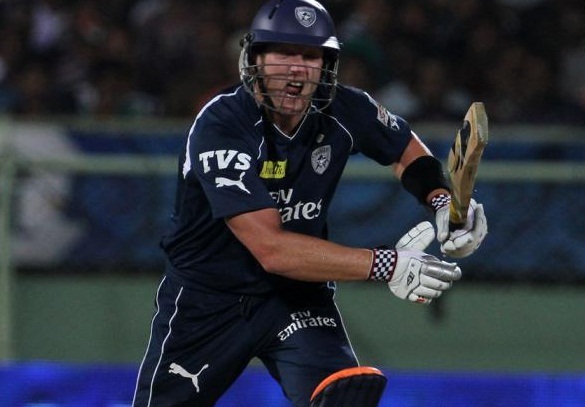 Cameron White fired on all frontiers by blasting 78 runs off 46 balls which earned the maiden triumph for Deccan Chargers vs. Pune Warriors in the IPL 2012. Deccan Chargers smashed 177 runs with six wickets in hand and Pune Warriors scored 159 runs for the loss of seven wickets. Cameron White (Deccan Chargers) was declared ‘Player of the match’ for his fiery knock of 78 runs while murdering the rival bowling attack. The 35th match of the Indian Premier League was held at Subrata Roy Sahara Stadium, Pune, on Thursday, April 26, 2012. Earlier, Deccan Chargers captain, Kumar Sangakkara won the toss and opted to bat with a hope to post a defendable score on board which can earn them their first win of fifth edition of the IPL. The innings was opened by Parthiv Patel and Shikhar Dhawan in a sparkling way as they punished Ashish Nehra for 16 runs in the first over with 3 fours. Dhawan was dropped in the third over by Marlon Samuels at his own bowling and the batsman responded with a six on the last ball. The openers provided a stand of 39 in four overs when Dhawan was unluckily run out for 16 and 11 runs later, Patel was caught by Manish Pandey off Bhuvneshwar Kumar for 24 scored from 18 balls with one six and 3 fours. Cameron White and Sangakkara crafted the innings with patience but their partnership was broken after the addition of 33 runs when the latter was clean bowled by Rahul Sharma for 12 runs. Jean-Paul Duminy replaced the skipper and immediately White changed his gears by gathering a couple of fours in the 12th over. Duminy secured his end and kept the score board moving as White achieved his maiden IPL fifty on the fourth ball of the 15th over with a four. White gave a harsh treatment to Sharma by dispatching 18 runs with the help of two sixes and one four in the 16th over and added a couple of more flying boundaries before he became the fourth victim for 78 off just 46 balls with 5 sixes and 6 fours. Duminy remained unbeaten for 26 as Deccan Chargers amassed 177 runs for the loss of four wickets in the allotted 20 overs. Marlon Samuels, Bhuvneshwar Kumar and Rahul Sharma were the only successful bowlers with one wicket each. Pune Warriors lost their first wicket for just 15 runs in 2.3 overs as Manish Pandey and Sourav Ganguly enhanced the score upto 43 when the stumps of Pandey were uprooted by Rusty Theron for 21 runs. Ganguly and Robin entered in the twenties but were unable to consolidate as the bowlers of Deccan Chargers continued picking up the wickets at regular intervals. Pune Warriors faced a difficult situation when they lost their five top order batsmen for 91in 14 overs. Steven Smith and Mithun Manhas tried their best to reach the target as the first gathered one six each from 15th to 17th over. Smith became the sixth victim for 26 off 13 balls with 3 sixes as the total reached 123. Manhas was still at the crease for 22 off 14 deliveries with two sixes as Pune Warriors managed 159 runs with three wickets left in 20 overs. Rusty Theron and Ashish Reddy were the top wicket takers with two each whereas Ankit Sharma and Manpreet Gony claimed one wicket. Deccan Chargers won the match comfortably in the end while celebrating their maiden victory of the IPL 2012. Pune Warriors – 8 points from 9 games at a run rate of -0.064. Deccan Chargers – 3 points from 7 games at a run rate of -0.708. Pune Warriors India threw the match away. It was batting pitch and if they had played sensibly they would have won. Well why to complain, Deccan Chargers deserved at least one victory in this IPL.